Diverse, expansive, and wild. Olympic National Park is the brilliant, green gem of the national park system. It is known for its temperate rainforests filled with old growth trees, but the park offers so much more. A road trip through this park will lead you from sandy beaches to steamy hot springs to snowy alpine scenery. 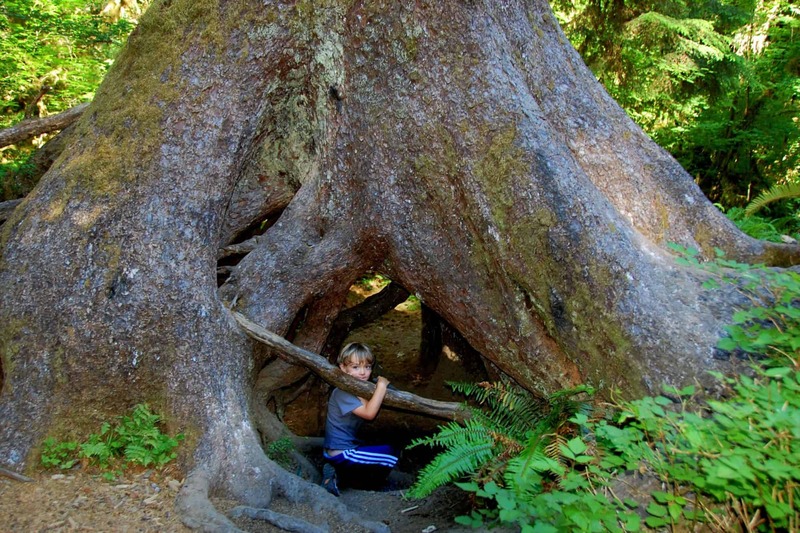 Here are some of our favorite things to do in Olympic National Park with kids. Olympic National Park is home to old-growth forests of spruce and fir draped in moss. If you are coming from the south will find the Quinault Rainforest easiest to get to. This rainforest surrounds Lake Quinault, a peaceful blue standout in an otherwise lush, green landscape. The Quinault Rainforest Loop Drive is a 31-mile loop around Lake Quinault. There are many opportunities to get out of the car and see waterfalls, wildlife, or just take a walk through the forest. Try the Falls Creek Loop (1.6 miles), Quinault Big Cedar Trail (.2 mile), Maple Glade Rain Forest Trail (.5 mile loop) or Kestner Homestead Trail (1.3 mile loop). The Lake Quinault Lodge is a grand lodge built in 1926 that exudes rustic elegance and a distinctive “Dirty Dancing” vibe. With its massive rain gauge (which measures in feet! 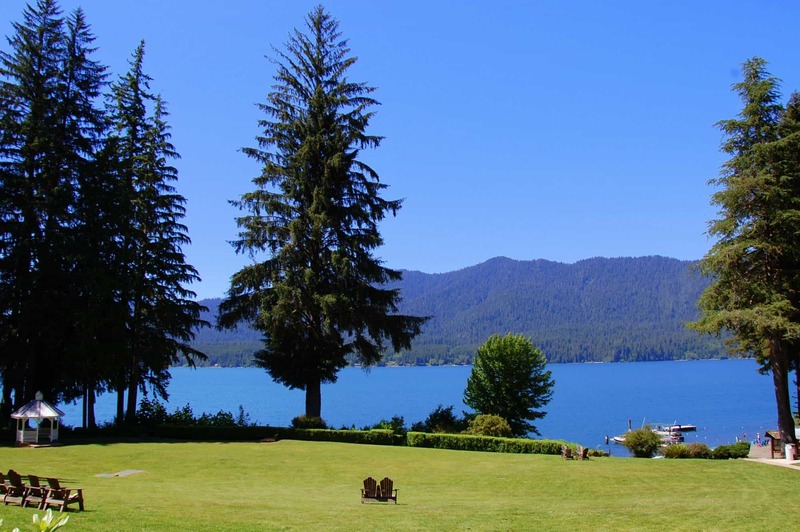 ), grand lawn sprinkled with Adirondack chairs looking out at the lake, and evening lake tours on the lodge’s patio boat, Lake Quinault Lodge is the kind place that keeps families coming back generation after generation. The rainforests of Olympic are impressively wet, receiving about 150 inches of rain per year. One of the best things to do in Olympic National Park is walking the Hall of Mosses Trail inside Hoh Rainforest. The forest is usually damp with either rain or moisture left by heavy clouds. Be sure to bring a rain jacket and wear close-toed shoes with good soles. This 0.8 mile loop trail winds through a pristine old growth forest. Families will marvel at trees growing from the logs of fallen giants and moss hanging like forest curtains. The stream so clear that you can see a tiny forest of water plants growing along its bottom. If you are looking for a more extensive hiking adventure, you may want to spend a couple days hiking the Hoh River Trail. This trail leads 17.3 miles to Glacier Meadows and Mount Olympus. Northwestern Washington’s beaches are wild, remote, and fun to explore. 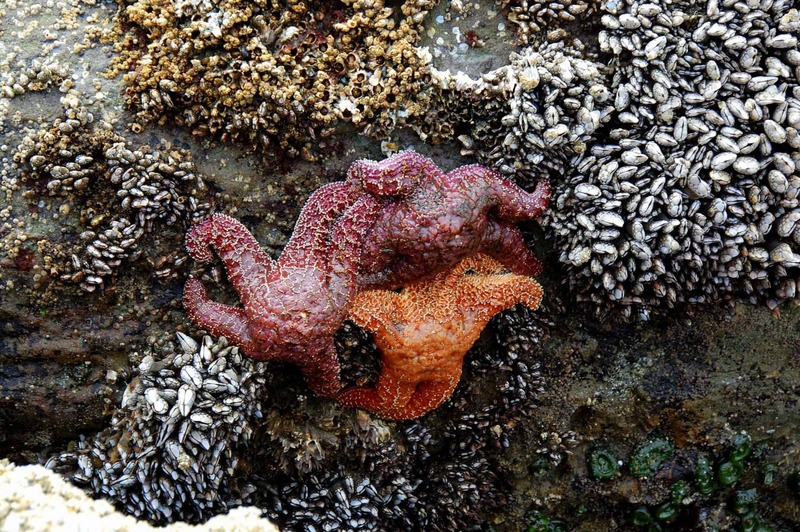 One of our favorite things to do in Olympic National Park is to go tide pooling. Stepping onto Beach 4 is like walking into tide pool heaven. During low tide, sea anemones hang from massive boulders like dripping blobs of flubber. Sea stars gather on towering rocks in massive clumps, using their steel grips to hang on and wait for the tide to return. Mussels carpet the lower portions of most boulders, giving them the appearance of having massive shellfish beards. On the seemingly never-ending stretches of sand, massive spruce and fir logs are scattered about, smooth and silvery from being tossed in the surf like matchsticks. The days are often cold and cloud-covered, but the discovery of tree bones shaped like other-worldly creatures perfectly rounded skipping stones will distract you from the chill in the air. Beach 4 and Ruby Beach can be accessed via a 0.2 mile trail from their respective parking lots. Second Beach is 0.7 miles from the road in La Push. All three have great tide pools. It is a 1.5 mile from the road to Rialto Beach. A natural arch and tide pools are your rewards for your efforts. 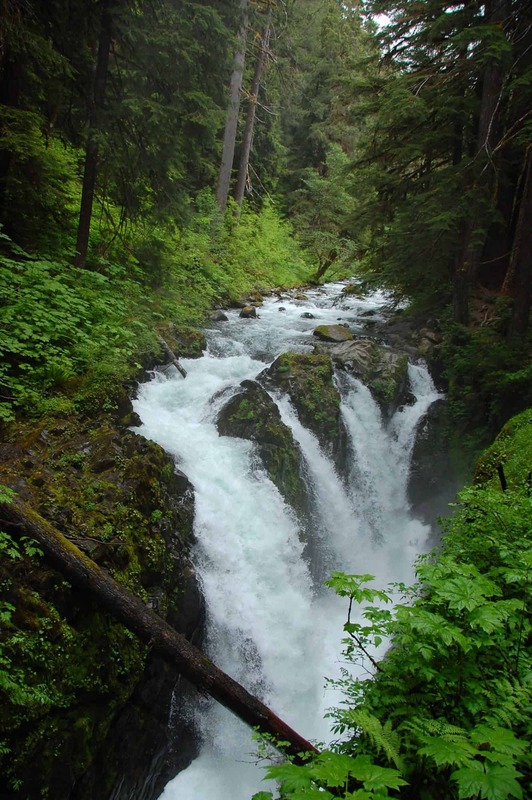 Deep in the rainforest you will find Sol Duc, a hot springs known for its healing mineral waters. Sol Duc Hot Springs, pools are open to park visitors for a fee. There is a shallow warm pool meant for all ages (kept around 95 degrees), a larger hot pool suitable for children over 4 (102 degrees), a hotter pool (106 degrees) best for older children and adults, and large pool which was heated to about 83 degrees. If you are hoping to spend a couple days in the parks forested interior but don’t feel like soggy tent camping is right for your family, a stay in one of Sol Duc Hot Spring Resort’s cabins may be for you. Staying at this resort gives guests complimentary access to the hot springs. The exteriors have a rustic charm, complete with rocking chairs and picnic benches within view of the Sol Duc River. Some cabins do have kitchens. One of the most popular things to do in Olympic National Park is to take the trail to Sol Duc Falls. It is no surprise that Sol Duc Falls is the most photographed spot in the park. The hike is incredibly scenic and leads hikers across several little bridges along the way. Hikers will enjoy a view of the falls from above as they plunge down a chute and deep into the thick forest below. A brilliant blue jewel surrounded by forests of green, Lake Crescent is truly an icon of Olympic National Park. Equally iconic is the Lake Crescent Lodge, a grand old hotel that sits on the lake’s shore. The lodge features traditional rooms as well as one and two bedroom cabins. Even if you choose not to stay at the lodge, a meal in the lodge’s dining room is still a nice treat. The restaurant specializes in Pacific Northwest food with locally sourced ingredients. Kayak, canoe, and paddle board rentals are available as well as guided kayak tours. 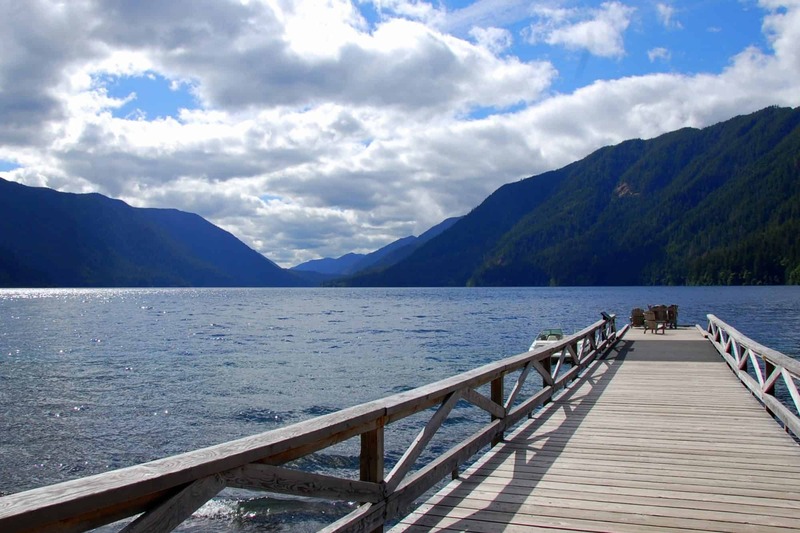 You may fish on Lake Crescent, known for its Beardsley Trout. The lake is also a great place to do some biking. Bring your own bikes or rent from Log Cabin Resort. We suggest the 4-mile Spruce Railroad trail which runs along the north shore in an old railroad bed. The most popular hike in the area is the 2-mile round trip hike to Marymere Falls. The trail leads to the waterfall which plunges 90 feet. The hike is mostly flat except for the final climb to the falls. If you are looking for an easy hike that is suitable for all ages, the Moments-in-Time trail is a 0.6 mile loop which wanders through forest, meadow, and along the lake’s shore. Olympic National Park also features a beautiful alpine landscape. 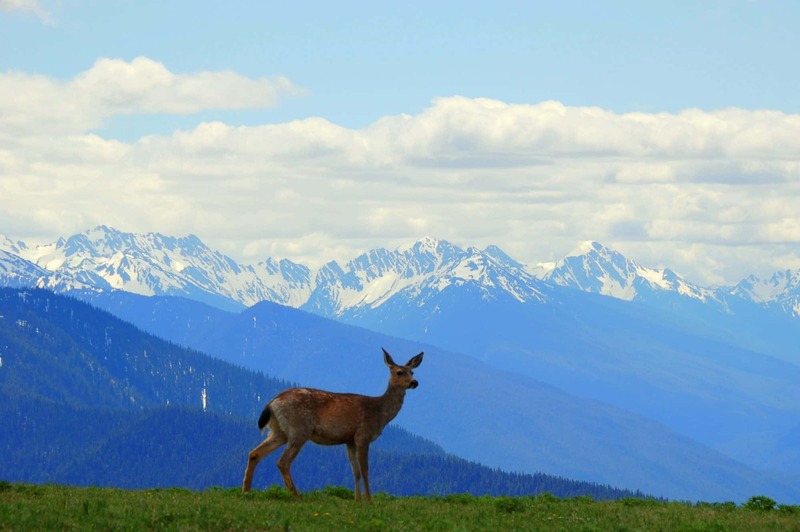 The best things to do in Olympic National Park visit the mountains up at Hurricane Ridge. Hurricane Ridge is 17 miles south of Port Angeles and the road up the mountain is open year round, except for when weather closes it temporarily. Once at the top, be sure to explore the Hurricane Ridge Visitor Center where rangers can give you tips on which hikes to take based on your family’s schedule and abilities. Views are amazing in every direction at Hurricane Ridge. Enjoy snow-covered peaks, deer grazing on delicate summer wildflowers, or gazing at the world down below. Across parking lot from the visitor center, a short trail leads to a lookout point with views of Sequim, the Strait of Juan de Fuca, and Canada. Lead Image by: Bigstock/neelsky . All other photos by Sharlene Earnshaw. 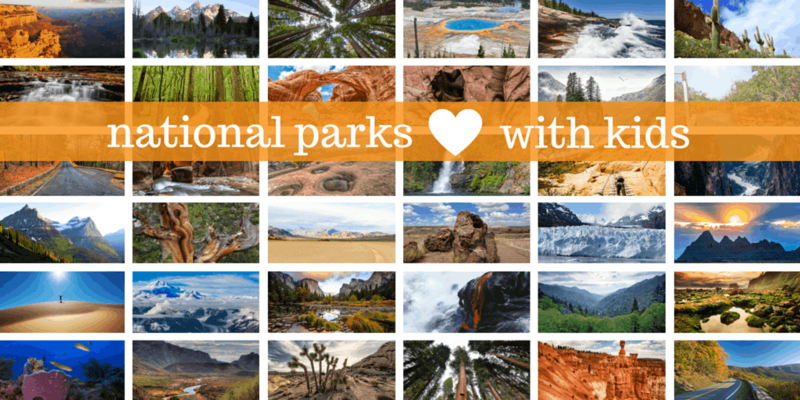 Ready to explore all the Best National Parks for kids? Sharlene Earnshaw is Trekaroo’s Editor in Chief. She lives in sunny Orange County, CA, with her husband and 10-year-old son and daughter (twins!). She is a self-proclaimed National Park junkie and has the goal of visiting each and every one with her kids. When she isn't traveling to places like Norway, Peru, Disney World, and Hawaii with her family, she enjoys hiking, beach days, obsessively rooting for the San Francisco 49ers, and planning her brood's next trip.